The Office of Special Education and Rehabilitative Services (OSERS) strives to enhance its Individuals with Disabilities Education Act (IDEA) website continually. OSERS launched its IDEA website in June 2017 in order to provide updated department information regarding the IDEA to the public including students, parents/families, educators, service providers, grantees, researchers and advocates. Prior to and after the launch of the site, OSERS gathered feedback from the public and has made updates to the site based on the feedback it received. OSERS will continue to gather feedback about the website in order to enhance and add content to the IDEA website to ensure the site remains current. Comment below if you have feedback regarding the IDEA website. The Office of Special Education and Rehabilitative Services will automatically direct users from the Building the Legacy: IDEA 2004 site to the new Individuals with Disabilities Education Act (IDEA) website starting April 30, 2018. 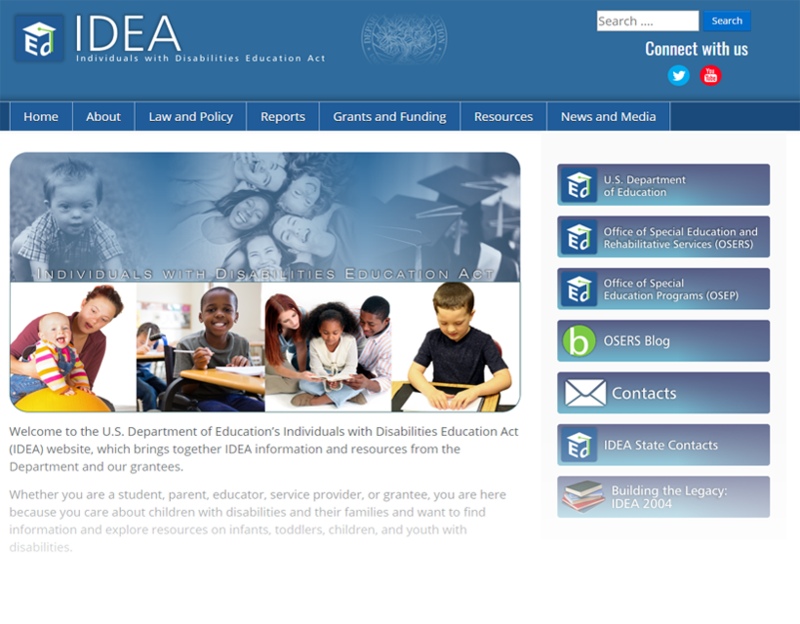 OSERS launched the new IDEA website in June 2017 in order to provide updated department information regarding the IDEA to the public including students, parents/families, educators, service providers, grantees, researchers and advocates. IDEA website users are encouraged to bookmark the new IDEA website: https://sites.ed.gov/idea. While the Legacy site will redirect users to the new IDEA site on April 30, content from the Legacy site is available for reference on the new IDEA website on the Building the Legacy: IDEA 2004 historical reference page. The Legacy site was developed in 2006 as a result of the 2004 reauthorization of the IDEA. The site was developed and updated mostly between 2006 and 2011. It had not received updates since 2013. OSERS determined it would leave the Legacy site live after the new site launched to provide stakeholders ample time to compare the two sites, adapt to the new site and provide feedback to OSERS. OSERS has made updates to the site based on the feedback it received from stakeholders since the initial launch of the new IDEA website. OSERS will continue to gather feedback about the new website in order to enhance and add content to the new IDEA website to ensure the new site remains current. Stay tuned for video tutorials highlighting features of the new site in the coming months. If you have feedback, comment on the IDEA Website Feedback blog. The new website can be found at: https://sites.ed.gov/idea. The Building the Legacy: IDEA 2004 site can still be found at: http://idea.ed.gov. The Department of Education experienced latency issues across all ed.gov sites June 1-3. These latency issues caused links to timeout and documents to freeze. If you experience site delays, please let us know below. 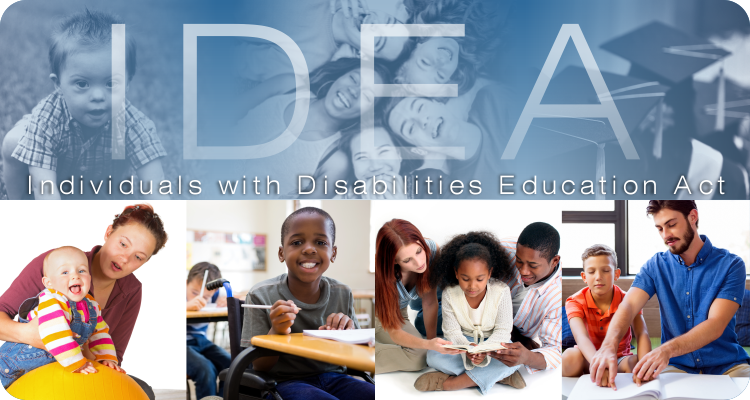 The new and improved Individuals with Disabilities Education Act (IDEA) website has arrived! During the last two months, more than 130 of you have taken the time to offer thoughtful feedback as to what you would like to see in a revamped IDEA website. Thank you for your important and informative comments. You asked for a visually-appealing, easier-to-use site that reduces the number of clicks it takes to get you where you need to be. We’ve updated the design and worked to simplify the site’s interface to make locating information more intuitive to the user. You asked that we keep the statute and regulation search capabilities from the Building the Legacy: IDEA 2004 site but also include a policy document search. We kept the search capabilities, but we updated the search to reflect the most recent statute and regulations. As many of you requested, the search also includes policy documents, such as Dear Colleague letters, OSEP memos, FAQs and policy letters. You asked that we highlight resources specific to various IDEA stakeholder groups. We’ve created resource pages specific to parents/families, educators/service providers, and grantees. For non-English speakers, we created a Language Support page that links to one of our grantee’s resources in Spanish, and we’ve provided additional information about the Department’s language assistance, which is offered in more than 170 languages. You asked that we expand content and streamline the site’s resources covering IDEA and other federal agency-related initiatives. We expanded our Topic Areas page to include more topics with updated information and links to reflect Department and Federal resources as well as resources from the Office of Special Education Programs-funded grantees. We’ve provided links to existing IDEA-related data reports, State Performance Plans/Annual Performance Reports and grant award letters. We’ve highlighted laws and resources related to individuals with disabilities that are under the jurisdiction of other Departments and Federal agencies. We’ve pulled together a list of frequently-used acronyms and terms. Relevant content from the Legacy site has transitioned to the new IDEA site and the Legacy site will remain online while we continue to refine the new IDEA site. We would like to get your feedback on the new IDEA website as we continue to develop and enhance the content and functionality. Your feedback on the site is essential for helping us improve the Department’s online resources as part of our commitment to ensure that infants, toddlers, children and youth with disabilities and their families have the supports and services guaranteed under the IDEA.